Camp Bijar is a small camp by size, but with a great opportunity for a relaxing holiday in an oasis of centuries-old pine forest. The camp is located just 500 meters from the historic town of Osor, also known as the museum town. Along the coast of the camp stretches a rocky beach with several sandy beaches, an ideal combination for those who love swimming, wind surfing and canoeing. - 50 m - 150 m metres from mobile homes. In the camping is supermarket and restaurant. The camping area includes a 100-metre pebbly beach and a 500-metre rocky coastline. 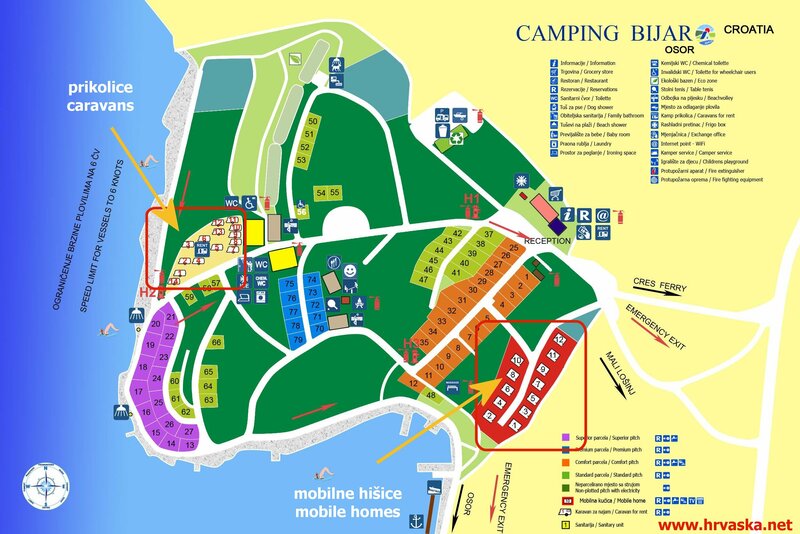 Camp Bijar is located in the heart of a centuries-old pine forest on the island of Cres in Croatia, despite administratively belonging to the island of Lošinj. The camp is situated in the immediate vicinity of the ancient town of Osor, often referred to as the museum town because of its numerous sculptures and cultural monuments. Osor lived its glory days back in ancient times when it was known as the most important port in this part of the Adriatic. Osor is known as a paradise for boating activities and as well as being an excellent starting point for hikes and bike trips on tracks running along the shore. Sports enthusiasts will surely enjoy the camp, especially canoeists and windsurfers because the camp is a popular destination for these kinds of sports. Other available sports include beach volley, basketball and table tennis. Those more daring will surely find a challenge in climbing to the Televrin peak at an elevation of 588 meters on Osoršćica, a hill above Osor providing unique and magnificent views of the entire island of Cres, the Lošinj Archipelago and other nearby islands and the mainland.